First up, I have a polish that a lot of people love, but in the bottle it looks so...I don't know, murky?...to me, Orly Coachella Dweller. Let me begin by saying that Blogger magically turned the color of Coachella Dweller into a pea soup green. It looks totally different from the picture I just took and uploaded. Oh well. The second pic looks like the The Real Coachella Dweller. :) I decided after I got it on my nails that it's not as disturbing as I once thought...more like that comforting fern green you'd see in a therapist's office at your weekly session. I used 3 coats, as the formula was a tad thin. Next up is a polish graciously given to me by sweet Yun of The Polish Hideout. You may remember all of my whining last year about not being able to find the Nicole by OPI Tink Collection...well, Yun kindly sent me 2 of the polishes that I loved from the collection, including Sweet on Pete. Wow. Now that's one frightening green. I remember having been somewhat bothered that I liked it so much on Yun. That's just plain old zombie blood there...or rotting meat...or appendicitis. I used 3 coats after experiencing some streakiness. Oh, and please excuse all the dents in the polish...I was doing yard work for a couple of hours and poked myself with quite a few sticks before I took pics. :P Sweet on Pete is touch greener than Sally Hansen Triple Shine Statemint I posted about earlier. And last I have another disturbing Orly, It's Not Rocket Science. This one could be called "Glamorous 70's Funeral." This one is from the Cosmic FX 2010 collection, and I'm not sure if it's still a part of their core line or not, as is another one from this collection, Space Cadet. Ahhhh, well, if it's got to look like nausea, at LEAST it can sparkle, right?? 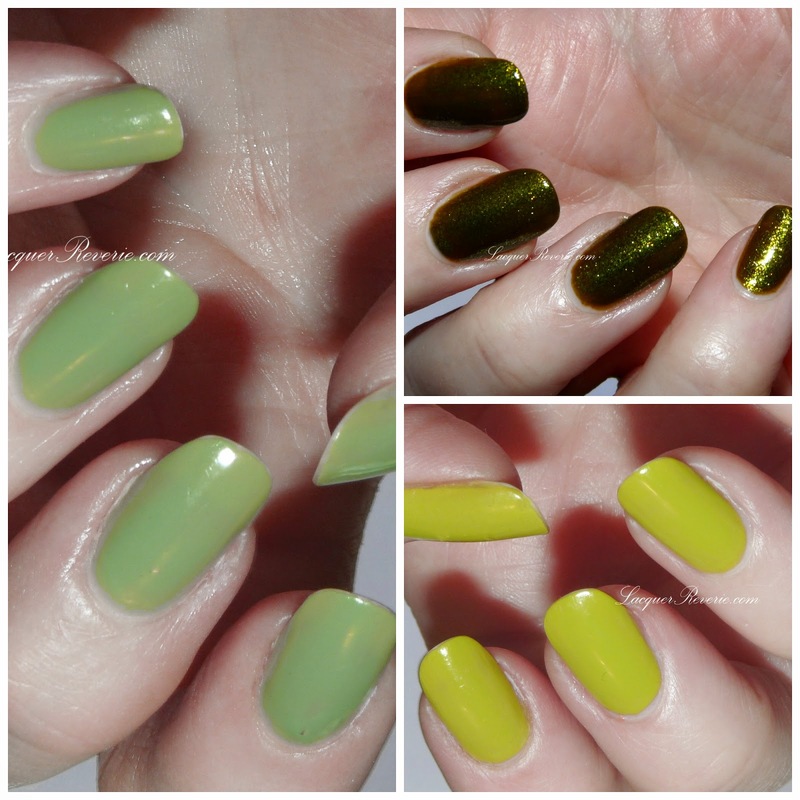 It's Not Rocket Science is a goldish-green with a crazy amount of glittery goodies that just light up the polish. It's a bit sheer, so I used 3 coats for opacity. And I checked: butter LONDON Wallis is darker and more gold; It's Not Rocket Science is definitely more green. So...what are your feelings about my disturbing greens? Are they the stuff of your nightmares, or perhaps your dreams?? Fun shades of green! Its not a color I would usually wear out but I think there fun to sport every once in a while. I love It's Not Rocket Science in general and Sweet On Pete is another one of those fugs that look really freakin' cool on you, but... Coachella Dweller....😐 Sorry sweets. I love It's Not Rocket Science, but the other two are a pass for me. I like the swampy greens that are shimmery, but the creams don't do anything for me. Disturbing greens are awesome! The I Love Zombies I've mentioned before is a Disturbing Green, like an odd olive-ish green rather than the chartreuse I said it was. My chartreuse radar was off! Love these greens on you, pea soup, zombie blood and all!